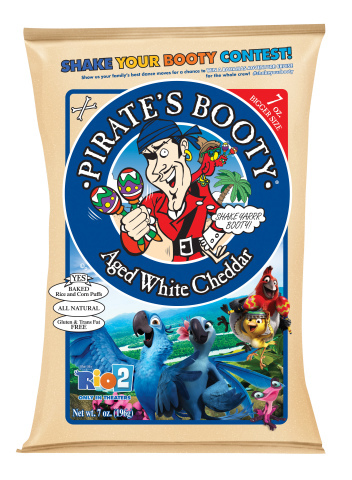 The Limited Edition Rio 2 7-ounce package is for Pirate’s Booty’s best-selling product – Pirate’s Booty Aged White Cheddar. Pirate’s Booty Aged White Cheddar is a deliciously baked snack made from puffed rice corn and blended with real aged white cheddar cheese. Pirate’s Booty has half the fat and fewer calories than regular fried potato chips, so it is a snack that kids and parents agree on. Pirate’s Booty contains no artificial colors, flavors or preservatives and is also trans-fat, gluten, peanut and tree nut free. The Limited Edition Rio 2 7-ounce package will be available at retailers nationwide now through the end of May 2014. Also as part of the program, Pirate’s Booty is offering consumers a chance to win a “Bahamas Adventure Cruise” for the entire crew through the “Shake Your Booty” contest. Consumers can enter for a chance to win by capturing their families’ best dance moves and entering the “Shake Your Booty” contest on Pirate’s Booty’s Facebook page. For more information and a complete listing of official contest rules, terms and conditions, please visit www.facebook.com/piratesbooty. Pirate Brands has been creating delicious and wholesome, baked snack treasures since 1987. Pirate Brands was founded on the belief that you shouldn’t have to “snackrifice” taste and fun for deliciously baked, trans fat and gluten free snacks. Pirate Brands’ snacks, which include Pirate’s Booty, Smart Puffs and Original Tings, are free from fryers and ingredients you can’t pronounce, Arrrrrr. For more information, please visit www.piratebrands.com. B&G Foods, Inc. (NYSE:BGS) and its subsidiaries manufacture, sell and distribute a diversified portfolio of high-quality, branded shelf-stable foods across the United States, Canada and Puerto Rico. Based in Parsippany, New Jersey, B&G Foods’ products are marketed under many recognized brands, including Ac’cent, B&G, B&M, Baker’s Joy, Brer Rabbit, Cream of Rice, Cream of Wheat, Devonsheer, Don Pepino, Emeril’s, Grandma’s Molasses, JJ Flats, Joan of Arc, Las Palmas, Maple Grove Farms, Molly McButter, Mrs. Dash, New York Style, Old London, Original Tings, Ortega, Pirate’s Booty, Polaner, Red Devil, Regina, Rickland Orchards, Sa-són, Sclafani, Smart Puffs, Sugar Twin, Trappey’s, TrueNorth, Underwood, Vermont Maid and Wright’s. B&G Foods also sells and distributes two branded household products, Static Guard and Kleen Guard. For more information, please visit www.bgfoods.com. One of the world’s largest producers and distributors of motion pictures, 20th Century Fox Film produces, acquires and distributes motion pictures throughout the world. These motion pictures are produced or acquired by the following units of FFE: Twentieth Century Fox, Fox 2000 Pictures, Fox Searchlight Pictures, Fox International Productions and Twentieth Century Fox Animation.